What is the Watchman Device and How Does it Work? As a sonographer, you may have heard about the Watchman procedure. You may have heard of it at a conference, through a journal, or perhaps at your own institution. Since echo, specifically transesophageal echo (TEE) is an integral part of the Watchman intraprocedural oversight, sonographers are often involved with some aspect of the procedure. 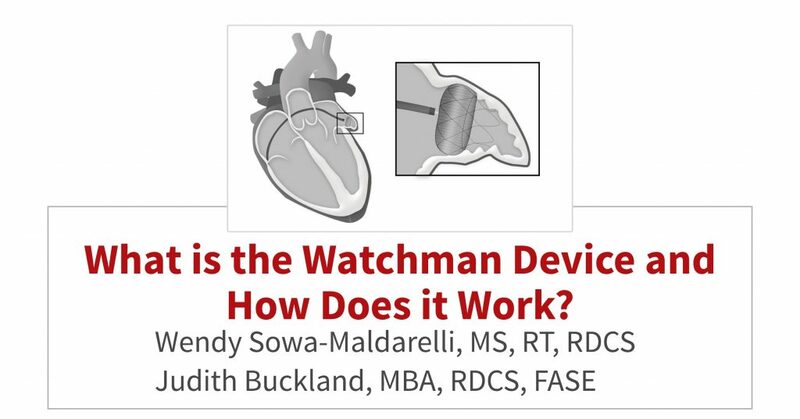 For this reason, this week we will answer the question: What is the Watchman device and how does it work? 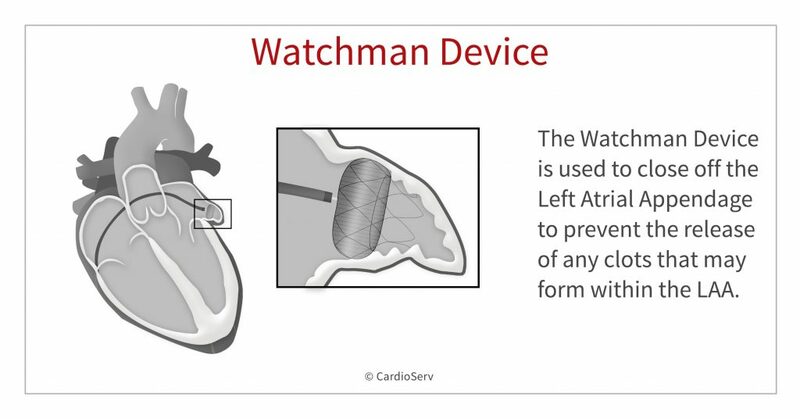 The Watchman device is used to close off the left atrial appendage. Specifically, it is a parachute-shaped, self-expanding device that is placed in the opening of the LAA. The device seals the LAA and prevents the release of any clots that may form within the LAA. Why Close-Off the Left Atrial Appendage (LAA)? Clots that form in the Left Atrial Appendage (LAA) can be carried to the brain in the bloodstream and this can lead to a stroke. Patients that suffer from atrial fibrillation are at an increased risk of strokes caused by LAA clots. Why? Remember that during afib the atria do not contract normally causing the atria and LAA to quiver. As a result, this makes the blood inside the appendage become stagnant, allowing thrombus (clots) to form. It is the most common source of cardioembolic stroke in Afib patients causing significant mortality and morbidity. Unlike the left atrium that develops from the pulmonary veins, the left atrial appendage is a remnant of the embryonic left atrium.1. 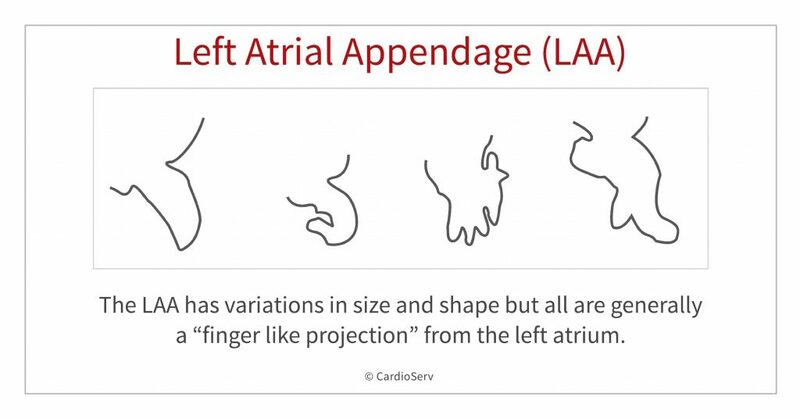 The LAA has variations in size and shape but all are generally a “finger like projection” from the left atrium. It’s pouch-like morphology and location creates a perfect-storm condition for thrombus development, especially in the setting of atrial fibrillation. Treatment varies and often includes some form of anticoagulation therapy. Unfortunately, due to bleeding risks and other patient contraindications, anticoagulation is not always an option. In an effort to prevent systemic strokes, there is a long history of surgical attempts to close the LAA including stapling, ligation or other occlusion devices. As procedures move to a more percutaneous approach, devices to ‘close’ the LAA have been developed. In 2017, the Watchman was the only Food and Drug Administration (FDA)-approved device for LAA occlusion. It is of nitinol construction with a fabric overlay and acts as a ‘plug’ for the LAA. Echocardiography is essential for LAA evaluation for thrombus, as well as pre-, intra- and post-procedural imaging. In addition, computerized tomographic angiography (CTA) is sometimes used during the screening process as a complement for difficult appendage anatomy. Two-dimensional (2D) and increasingly three-dimensional (3D) transesophageal (TEE) allows a detailed look at the highly variable LAA anatomy, as well as identification for the device ‘landing zone’ for best fit. A good fit will provide a sealing-off of the appendage to reduce the chance of being an embolic source in the future. The device is introduced through peripheral venous access, usually the femoral vein, proceeds up the IVC, into the right atrium, through a septal puncture into the left atrium. Additional imaging guidance from fluoroscopy or intra-cardiac ultrasound can be called upon during challenging procedures. 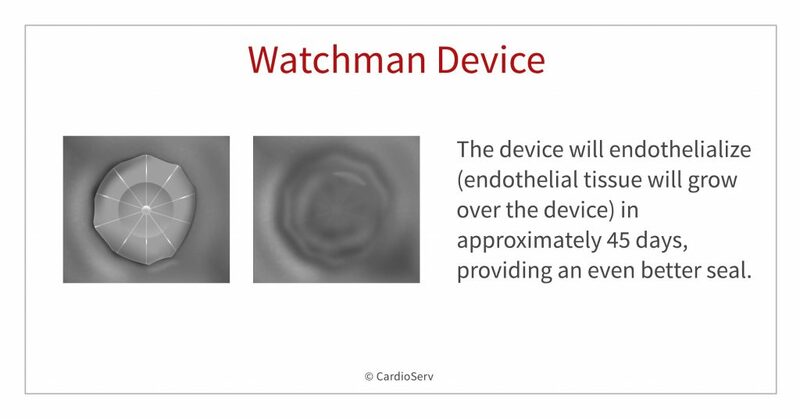 Once the needed measurements are made to decide device sizing the Watchman device is positioned with echo confirmation and the device is deployed. Maneuvers such as a mild tug are performed by the interventionalist to assure secure placement, and color flow Doppler assistance aids in detection of any para-device leaks. The device will endothelialize (endothelial tissue will grow over the device) in approximately 45 days, providing an even better seal. The patient will return for follow-up imaging to assess device seating and leak evaluation. Complications include perforation and pericardial effusion. The patients are usually placed on a warfarin-aspirin regimen to reduce the possibility of device thrombus. Major clinical trials, notably the EWOLUTION study, are responsible for assessment of device efficacy and safety. The Watchman device has provided favorable outcomes as well as improvements on complications that confounded other same-type devices. In view of this, we will be hearing more about the Watchman and other LAA-occlusion devices in the future. In conclusion, the Watchman is used to close off the left atrial appendage. It is a parachute-shaped, self-expanding device that is placed in the opening of the LAA. The device seals the LAA and prevents the release of any clots that may form within the LAA. Echo plays a role in the placement of the Watchman procedure and we will explore in detail the step by step procedural guide to performing this procedure with TEE guidance in a future issue. Thank you to Wendy Sowa-Maldarelli for collaborating with us this week on this topic. Please be sure to check out this week’s Educator Spotlight article to learn more about Wendy. Abdelmoneim, S.S., & Mulvagh, S.L. (2014). Techniques To Improve Left Atrial Appendage Imaging. Journal of atrial fibrillation, 7 1, 1059. So appreciate all your great articles .